Rose Theresa Iannone died peacefully on Sunday, January 21, 2018. She was 90. Rose was born to the late Anthony and Theresa Biondi DiNini on July 20, 1927, and grew up in Endicott NY. Rose met her husband Joseph Vincent Iannone, Sr. in Endicott and they married on August 12, 1950. They lived in Endicott where Joe worked at IBM and Rose was a housewife and mother. They had 4 children all born in Endicott. They moved to Raleigh NC in 1964 when IBM came to the Research Triangle Park. They lived there for many years raising their children and making many lifelong friends. Joe passed away in 1974. Rose then worked at IBM retiring in 1990. She also worked for JVI Construction for 30 years. She maintained her many friendships for many years. 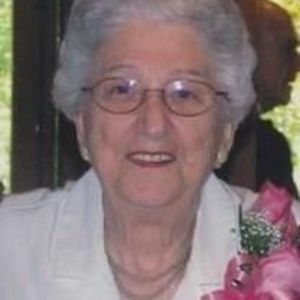 She was an avid reader, devoted to her church and to her grandchildren. She became well known for her Italian meatballs and sauce which graced many parties, get togethers and celebrations over the years. She was a devout Catholic and provided many years of service through the Alter Guild at Our Lady of Lourdes Catholic Church In Raleigh and St. Mary Magdalene Catholic Church in Apex, NC. Rose was preceded in death by her parents, her brother Anthony DiNini, her son David and her husband Joe. She is survived by her 4 children; Joan Iannone Galbraith (Albert) of Durham; Louis Anthony Iannone (Beth) of Apex; Patricia Iannone Rusciano (Bill) of Leitchfield, KY and Joseph V. Iannone, Jr. (Renee) of Apex and her grandchildren; Jessie and Marie of Apex, and Hannah and Matthew of Leitchfield, KY, Christopher Galbraith (Nicole) of Atlanta, GA and Jonathan D. Galbraith (Jennifer) of Fort Drum, NY, great-grandchildren; Alexis and Lauren of Atlanta, Ga and Jonathan, Emily and Elizabeth of Fort Drum, NY. In celebration of her life, visitation and a funeral mass will be held at St. Mary Magdalene Catholic Church, 626 Magdala Place, Apex NC 27502 on Wednesday January 24, 2018 at 1:30pm - 2:30pm. Mass will begin at 2:45 pm. Burial will be at Raleigh Memorial Park, 7501 Glenwood Ave., Raleigh at 11 am on Thursday, January 25, 2018. Condolences may be made at Apex Funeral Home, www.ApexFuneral.net In lieu of flowers contributions and gifts may be made to the Western Wake Ministry in Apex, NC. or St. Mary Magdalene Catholic Church, Apex, NC.